Virgo May 2016 Horoscope forecasts the dominance of career over domestic matters this month. Planetary aspects for business are powerful while for family are weak. You can put family issues aside for the time being. Some of the Virgins will be inclined towards social work and political affairs. After the mercury retrograde on 21st May, you will feel freer to execute your personal plans as you wish. 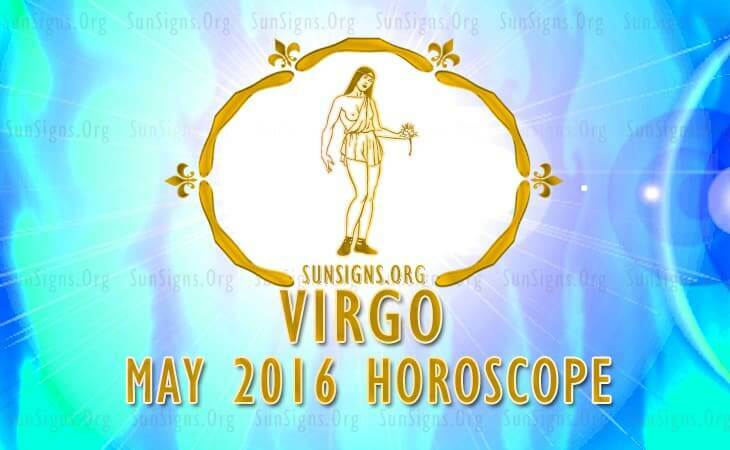 Self awareness, spiritual development and career will be equally important during May 2016 for the Virgo zodiac sign. The Lunar Eclipse this month will make things difficult for your friendships and professional life. Problems with family members and neighbors may crop up. Students will be faced with changes in their academic career. The Virgo 2016 May forecasts foretell that your career is at its zenith for the year and there will be plenty of accomplishments and progress in your professional life. Financial rewards and improvement in status at the work place can be expected. You tend to get guidance from spiritual leaders and from your own visions. Helping others socially with philanthropic causes will help your career development. Change in job is likely in May 2016 and you will be loaded with large projects. Virgo, your financial wealth will increase with the support of others in May 2016. Surplus money should be utilized to clear pending loans and to pay off taxes. You should review your spending habits and cut down unnecessary expenditure. During the second week of the month, your monetary plans will undergo modifications due to the eclipse. All important decisions and investments should be made before the 17th May. You should be more tolerant towards slow progress and overcome obstacles for fiscal growth. The love astrology for Virgo says that romantic opportunities arise at your work place or while chasing your career in May 2016. You will have the assistance of family members and superiors in forming love relationships. After the 22nd planetary positions are not favorable and all major decisions regarding love matters should be kept in abeyance. After the 17th, Virgo love and sexual relationships will face challenges and you should allow them to bloom slowly. Do not be in a hurry to expand your family before trying to understand your partner. Health will be delicate during May 2016 for the Virgins and requires more care after the 19th. You should concentrate on a few major issues and try to conserve your vitality with a regular fitness regime. And be sure to drink a lot of water. To conclude, the Virgo 2016 May horoscope foretells of a motivating period for career and business. So make the most of it this month!